Figure 7-2.-Typical small footing form. nail the lumber for the sides of the form, as shown in figure 7-2. FOUNDATION AND PIER FORMS COMBINED. - You can often place a footing and a small pier at the same time. A pier is a vertical member that supports the concentrated loads of an arch or bridge superstructure. It can be either rectangular or round. 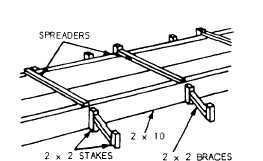 You build a pier form as shown in figure 7-3. The footing form should look like the one in figure 7-1. You must provide support for the pier form while not interfering with concrete placement in the footing form. You can do this by first nailing 2-by-4s or 4-by-4s across the footing form, as shown in figure 7-3. These serve as both supports and tie braces. Then, nail the pier form to these support pieces. 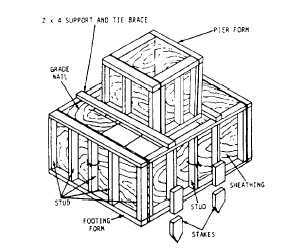 Figure 7-3.-Footing and pier form. Figure 7-4. - Typical footing form. wall footing. A bearing wall, also called a load- bearing wall, is an exterior wall that serves as an enclosure and also transmits structural loads to the foundation. 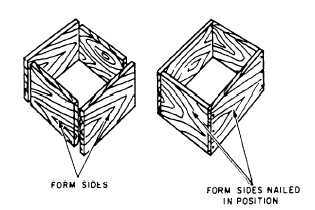 The form sides are 2-inch lumber whose width equals the footing depth. Stakes hold the sides in place while spreaders maintain the connect distance between them. The short braces at each stake hold the form in line. 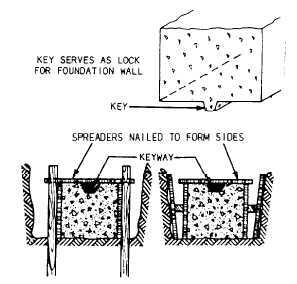 A keyway is made in the wet concrete by placing a 2-by-2-inch board along the center of the wall foot- ing form. After the concrete is thy, the board is removed. This leaves an indentation, or key, in the concrete. When you pour the foundation wall, the key provides a tie between the footing and wall. Although not discussed in this training manual, there are several commercial keyway systems available for construction projects. Figure 7-5. - Methods of bracing bearing wall footing forms and placing a keyway.